Basseterre, St. Kitts – The 2017 Climate Smart Sustainable Tourism Forum currently underway in St. Kitts comes at an ideal time since the Caribbean felt the effects of climate change as exemplified with the passages of hurricanes Irma and Maria. 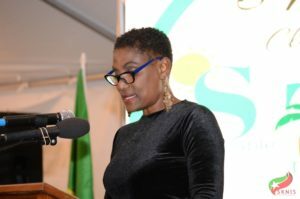 Climate change can have a tremendous impact on tourism and St. Kitts is doing its part to sustain its tourism product despite of this, says Permanent Secretary in the Ministry of Tourism Carlene Henry Morton. Speaking at the opening ceremony of the forum Dec. 11, Morton said that the economic benefits of the industry are unquestionable. She said that tourism has the power to transform economies and livelihoods for the better. Conversely, it can destroy cultures and communities. She added that it is up to the citizens, individually and collectively, to manage it responsibly to ensure the former and prevent the latter. It was said that that there must be a collective effort to reduce the environmental footprint of the diverse activities that relate to tourism. “Across economic sectors and across national and regional boundaries, our responses to climate change and sea level rise must be coordinated with and integrated into existing polices of socioeconomic development and environmental conservation, so we can facilitate both sustainable development and sustainable tourism,” Morton said.